I found this article very helpful and wanted to share it with our readers, enjoy! If you are going to store food, make sure that the food you store is adequate for the need you and your family anticipate. This may not be as easy as to achieve as many people think, because the facts are that most people make serious errors when storing food—errors that will come back to haunt them when the food they've stored is the only thing that stands between them and their empty, dissatisfied, bellies. Most people don't have enough variety in their storage. 95% of the people I've worked with have only stored four basic items: wheat, milk, honey, and salt. Statistics show most of us won't survive on such a diet for several reasons. a) Many people are allergic to wheat and may not be aware of it until they are eating it meal after meal. b) Wheat is too harsh for young children. They can tolerate it in small amounts but not as their main staple. c) We get tired of eating the same foods over and over and many times prefer to not eat, then to sample that particular food again. This is called appetite fatigue. Young children and older people are particularly susceptible to it. Store less wheat than is generally suggested and put the difference into a variety of other grains, particularly ones your family likes to eat. Also store a variety of beans, as this will add color, texture, and flavor. Variety is the key to a successful storage program. It is essential that you store flavorings such as tomato, bouillon, cheese, and onion. Never put all your eggs in one basket. 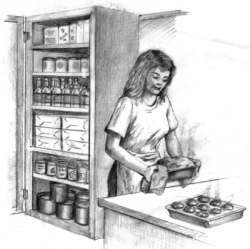 Store dehydrated and/or freeze dried foods as well as home canned and "store bought" canned goods. Make sure you add cooking oil, shortening, baking powder, soda, yeast, and powdered eggs. You can't cook even the most basic recipes without these items. 4. Quick and easy and "psychological foods"
Quick and easy foods help you through times when you are psychologically or physically unable to prepare your basic storage items. "No cook" foods such as freeze-dried are wonderful since they require little preparation, MREs (Meal Ready to Eat), such as many preparedness outlets carry, canned goods, etc. are also very good. "Psychological foods" are the goodies—Jello, pudding, candy, etc.—you should add to your storage. These may sound frivolous, but through the years I've talked with many people who have lived entirely on their storage for extended periods of time. Nearly all of them say these were the most helpful items in their storage to "normalize" their situations and make it more bearable. These are especially important if you have children. Time and time again I've seen families buy all of their wheat, then buy all of another item and so on. Don't do that. It's important to keep well-balanced as you build your storage. Buy several items, rather than a large quantity of one item. If something happens and you have to live on your present storage, you'll fare much better having a one month supply of a variety of items than a year's supply of two or three items. Always store your bulk foods in food storage containers. I have seen literally tons and tons of food thrown away because they were left in sacks, where they became highly susceptible to moisture, insects, and rodents. If you are using plastic buckets make sure they are lined with a food grade plastic liner available from companies that carry packaging supplies. Never use trash can liners as these are treated with pesticides. Don't stack them too high. In an earthquake they may topple, the lids pop open, or they may crack. A better container is the #10 tin can which most preparedness companies use when they package their foods. In all the years I've worked with preparedness one of the biggest problems I've seen is people storing food and not knowing what to do with it. It's vital that you and your family become familiar with the things you are storing. You need to know how to prepare these foods. This is not something you want to have to learn under stress. Your family needs to be used to eating these foods. A stressful period is not a good time to totally change your diet. Get a good food storage cookbook and learn to use these foods! It's better to find out the mistakes you'll make now while there's still time to make corrections. It's easy to take basic food storage and add the essentials that make it tasty, and it needs to be done. As I did the research for my cookbook, Cooking with Home Storage, I wanted to include recipes that gave help to families no matter what they had stored. As I put the material together it was fascinating to discover what the pioneers ate compared to the types of things we store. If you have stored only the basics, there's very little you can do with it. By adding even just a few things, it greatly increases your options, and the prospect of your family surviving on it. As I studied how the pioneers lived and ate, my whole feeling for food storage changed. I realized our storage is what most of the world has always lived on. If it's put together the right way we are returning to good basic food with a few goodies thrown in.